The rising sea level has alarmed the Orissa government. It has decided to combat it with geo-tubes. 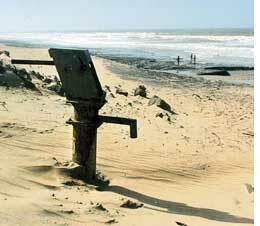 Orissa's director of environment, Bhagirathi Behera chaired a meeting on May 18 on the Integrated Coastal Zone Management Plan in which he said, "We are preparing to install geo-tubes composed of sand-filled high-grade rexine in areas being eroded by the sea". According to Behera, "Geo-tubes can weaken the impact of the land-eroding sea waves while withstanding the shock, unlike stone walls which start showing signs of ravage soon." First the government plans to install a 700-metre long geo-tube at Pentha in Kendrapara district, where the first cases of the sea engulfing villages were reported. The meeting came up with a Rs 100-crore World Bank funded plan to save Orissa's coast with an agenda to reforest mangrove depleted areas, save Olive Ridley turtles and ensure livelihood of fishing and other dependent communities. Activists, however, point out the futility behind yet another fund driven plan that focusses only on the eroded areas, forgetting that the ingress of the sea is the result of rapid industrialization, a process that has been furiously wiping out mangroves. This has led to climate change on Orissa's coasts. Arttabandhu Mishra, an environmentalist, says, "This is just treating the symptom, not the cause". Noted environmentalist Biswajit Mohanty adds, "Orissa is blindly violating Coastal Regulation Zone rules and industrialization along the coast has been happening at the cost of the mangrove forests". The ground reality is that in a span of 50 years more than 1,000 sq km of mangroves in Orissa have been reduced to a mere 219 sq km. Remote-sensing pictures taken by Salyut-7 during the 1970s revealed that every year nearly 2.5 sq km of mangrove vegetation was lost to industrialization. According to government sources, until 1940, the entire Mahanadi delta was covered by mangroves. Today, most islands wear a denuded look. The damage started with the construction of Paradip port in the 1960s when more than 2,500 hectares of forests were sacrificed. The Paradip-Dhamra belt has since then emerged as a highly cyclone-prone zone. Using satellite maps and assessing other coastal country data, a World Bank report of 2007 confirms that with a metre of sea-level rise, approximately 194,000 sq kms and 56 million people in 84 developing countries would be affected. In India, Orissa is the most vulnerable to rise in sea-level; a metre of sea-level rise here will inundate about 800 sq km. The Satabhaya sea level rise case is an ominous pointer. In 2005, when this correspondent visited this area, about 1,000 people lived in two villages: Satabhaya and Kahnpur in Kendrapara district. The sea has since advanced nearly 300m inward, forcing about 150 families to migrate. The sea waves have already forced the opening of a new mouth in the Chilika Lake which has the potential to drastically change the hydrological character of Asia's largest brackish water lagoon. Now with the Bay of Bengal threatening to erode larger tracts of coastal Orissa, the government on August 12, decided to rehabilitate all families from the Satabhaya area to a location of their choice. Each family would be entitled to 2 acres (.8 ha) of agricultural land, 2 decimals of homestead land and money equalling the value of a low cost Indira Awas Yojana house. The Satabhaya villagers however suspect this move as a pre-election stunt. Earlier on August 6, the government decided to raise walls on the Puri beach at a cost of Rs 7 crores, a scheme which is supposed to be implemented soon. Last year, the Gopalpur beach was eroded drastically but it is not yet in the plan. The matter once again comes back to square one, say environmentalists; the government is busy hatching more management plans, instead of considering the impact of climate change due to global warming and developing a scientific plan to save the coast of Orissa, before it is too late.